A dark olive-brown bird moves between twigs and branches. The trees are on the slope above the crater lake are not so high. This allows for very nice pictures of birds, which would otherwise be rather up in the canopy – largely invisible from the ground. This time, the brown bird with the striking beak is not a banded wattle-eye. At first sight it reminds me of an Terrestrial Brownbul (Phyllastrephus terrestris). 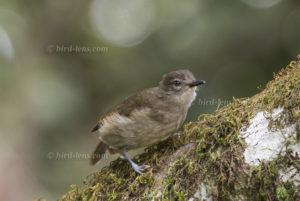 But this Brownbul is a bird more confined to a variety of thickly vegetated habitats in evergreen forests mostly in the lowlands and coastal scrub of southern and eastern Africa. This medium-sized, relatively elongated, simple-looking bird is a Greenbul with a relatively long and fine beak. Lores, throat and the side parts of the face are light grey. While the tail appears rather brown, the predominant color of the wings and the back is olive. This is the Cameroon Olive-Greenbul (Phyllastrephus poensis), which is – unlike the previously seen Cameroon Montane Greenbul (Andropadus montanus) – not particularly olive green. 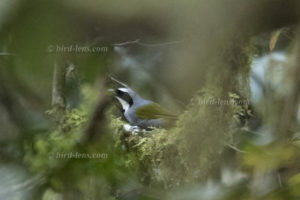 We are lucky, because the species is limited in its distribution only to the ecoregion of the Cameroon mountains although the bird is not so rare in its distribution range.